♥ I thank God for seeing me through another week. Today is Thursday. I am reminded to count my blessings and be thankful to God for His many mercies. ♥ I thank God for blessing my family as we celebrated my mother's 70th birthday last Thursday. Thanks for all your prayers and well-wishes! Thank God for His many mercies. It was a very blessed time of reunion for my mum, me, my sister and my 2 brothers, together with their families. ♥ I thank God for His mercies daily in sustaining me and giving me simple joy in Him. Recently, my health has not been good. I have cut down on activities, trying harder to slow down and pace myself. Thank God for His grace daily. ♥ I am thankful to God for seeing us through almost another year! How time flies! The Lord has blessed me in many wonderful ways this year. I am thankful to God that I can spend more time serving Him this year by working freelance. I was able to visit some sick and elderly people in the hospital and at their home. It is a joy to bring God's love and comfort to these dear saints. I thank God for giving me the joy and strength to serve Him. 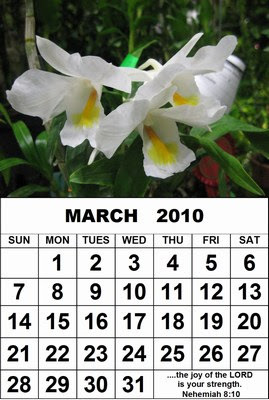 ♥ I am thankful to God that I can serve Him in little ways by making simple calendars for friends. 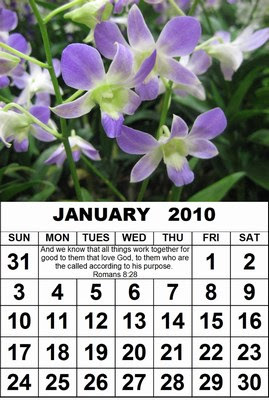 Here is a simple Christian calendar for 2010 that I wish to share with you. The pictures are of the Orchid Flower, the national flower of Singapore. I took these pictures at a flower exhibition in Singapore. 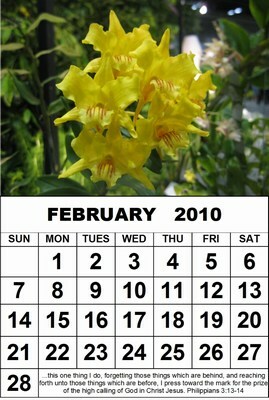 Hope you will find this calendar useful for you and your friends. 2) Use a color printer to print. 3) Insert the picture into a Word Processor such as Microsoft Word (MS Word) or OpenOffice. ♥ I thank God for my family and my church. ♥ I thank God for everyone of you and all my blogging friends. Thanks for all your prayers and encouragements through this blog and email. May God bless you all! Hi Nancie! Time certainly flies! Time to take stock and reflect again. Glad that you had a wonderful time during your mom's birthday. Love the shots you've taken of the orchids. They are so pretty! It's really so nice of you to turn them into calendars to share with everyone here. Keeping you in my prayers. Take good care of yourself now and rest well. Your calendar photos are beautiful. That is quite a wonderful gift to all. I am so glad to see you blessings are many this week. What a beautiful calendar! Hope you have a wonderful day! The calendar photos are beautiful. That is a great gift idea. You have a lot of blessings - I think having your mother around for 70 years is pretty close to the top! Hope you have a blessed weekend. God bless your grateful heart. it's really nice to count your blessings instead of those you still lack. we know that in time, God will give us our wants, those that are in accordance to His will. we just have to wait patiently and expectantly. May God bless your precious heart, love you. I love your calendar. What a great idea. It's the first artistic project where I've said to myself, "I can do that." So, I'm going to return and download it. Thanks ever so much. It will enable me to look at my own photos this year! Dear LS & Happy, Grammy, Melissa, Debbie, Karen, Becky, Doylene, Rita, Pia, Denise and Susan, thanks for stopping by and all your encouragements! Thank God for His goodness and mercies to us. I am glad you find the calendars useful, Susan. Hope you enjoy making it! Take care and God bless all of you. ((((Hugz))) you know yhou always bless me when you drop by! !1 I loved reading your thankful list, and wow you have been busy creating too. Blessings Nancie, Always a true delight to see you back sharing your grateful heart on TT & knowing you are well enough to post one & even to come see me! What a joy! Speaking of JOY, I praise God for your mom & her 70th birthday! Please pass on my "happy birthday" wish for her to her & it's so nice that you all were able to get together! You have beautifully given thanks in a way that updates us on your life & service to God! How wonderful that you visit the sick & elderly and give of yourself & time to others in Jesus Name! Ohhh...and it is you who are a living testimony of a GIVER! I serve but you give & give. We make a good team. These precious homemade calendars that you make available are one of many examples of your giving heart...besides the example of visiting as Jesus would have us all do! I'm so blessed that you still give as you are being strengthened & pacing better! It is YOU who is the living testimony. Just read your own THANKFUL list! It is absolutely wonderful & a big blessing to me (us)! Your words are so true of how this year has quickly flown by...thank God for His grace that has seen us through to this day and soon 2010! Your calendars are absolutely gorgeous. Realizing I hadn't heard from you for awhile, I hopped over here, and second realization, I haven't become a follower yet:) I will do that. Nancie, your blog just overflows with warmth and gracious love. The generosity you show by sharing the calendars and other free resources is amazing. It's almost something you can feel, when you start reading here. I'm so glad that God has allowed me to know you through blogging. Thanks, Lorie, Peggy and Wendy, for your kind visits and many kind words of encouragements! It is so good to hear from all of you. Take care and hope you have a blessed week!